Washington, D.C. has become center stage for key globalization organizations which are on the move like never before. The main event as April winds up is the Annual Meeting of the highly-influential Trilateral Commission (TC) Friday, April 25 through Sunday, April 27 at the Mandarin Oriental hotel along the Potomac River. As of Friday evening, AMERICAN FREE PRESS was the only media in the world on the scene, other than reporters, editors and news executives who attend as TC members but don’t report a word. Dave Gahary spoke with reporter Mark Anderson, to learn more about what’s behind this story, in this informative interview (27:53). WASHINGTON, D.C.—Washington, D.C. has become center stage for key globalization organizations which are on the move like never before. The main event as April winds up is the Annual Meeting of the highly influential Trilateral Commission (TC) Friday, April 25 through Sunday, April 27 at the Mandarin Oriental hotel along the Potomac River. 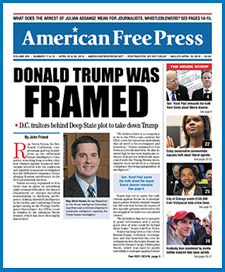 As of Friday evening AMERICAN FREE PRESS was the only media in the world on the scene, other than reporters, editors and news executives who attend as TC members but don’t report a word. This writer found that TC members began arriving Thursday evening. Among them was Goldman Sachs Chairman Peter D. Sutherland, who’s among the TC’s top officers and also is a regular attendee at the even more exclusive Bilderberg Meetings. Bilderberg meets in Denmark in latter May, likely in Copenhagen. TC European Chairman Jean-Claude Trichet, another Bilderberg luminary, also arrived that evening. Former Federal Reserve chairman and TC member Paul A. Volcker, Jr. was first spotted at the hotel Friday morning. Ex-Central Intelligence Agency director and TC member John M. Deutsch was seen Friday morning as well. Trichet, when merely asked for a brief comment, seemed startled by the prospect and declined to speak to this writer about even the most general ideas being discussed at the TC meeting. Still, there reportedly are some points of contention within the TC regarding how to structure world free-trade policies, as AFP learned when TC attendees arrived. And more and more people are waking up to the harsh realities of globalization. Therefore, the TC and other global outfits appear intent on making quick, huge strides to tighten their control along economic and political lines—before the current public awakening about globalization’s harsh realities becomes too widespread. In the United States, numerous Democratic Congress members don’t want to have to explain to skeptical voters why their president, Barack Hussein Obama, seemingly supports the massive pending free-trade pact known as the Trans-Pacific Partnership, or TPP. So, with Obama away on a belated Asian trip to try and finalize parts of the TPP, he’s having to walk a fine line to please global expansionists like many of those in the TC, and yet not offend members of Congress in his own party who largely don’t like the TPP. Most of the public has had its fill of free trade as well, in this 20th year since North American Free Trade Agreement’s (NAFTA) enactment. Furthermore, there is strong and growing domestic opposition in Malaysia and Japan regarding this same mega-free-trade deal, which will involve 12 nations if Japan joins. Japan’s leaders have promised to put all their economic sectors on the table for the four-year-old TPP talks, but the nation’s farm groups have made it tough for those leaders to accept the elimination of tariffs. Cancelling these import taxes, as called for under the TPP, could be catastrophic—since imported rice, dairy, sugar, wheat, pork and beef flooding in from other nations without a tax would undercut and possibly destroy the production of those very products in Japan. These products are foundational to Japan, and yet free trade proponents—which includes the vast majority of TC and Bilderberg members—would have Japan allow the virtual dumping of the same products into Japan from outside sources. Free-traders rarely bother to explain why any nation should import the very things it produces in abundance. Logically, nations need only import those resources and products that they don’t have or cannot make themselves. A TC member spoke to AFP—on condition of anonymity. That person said that there is some controversy among TC members on the U.S. sidestepping multilateral (multi-nation) trade arrangements under the World Trade Organization, and instead pursuing bilateral trade pacts—such as the proposed U.S.-European Union trade pact known as the Transatlantic Trade and Investment Partnership (TTIP). This person feels inclined to not support the TPP and TTIP, because that person believes neither pact conforms to the General Agreement on Tariffs and Trade, or GATT, model approved 20 years ago under President Bill Clinton—who also “blessed” much of the Western Hemisphere with the ruinous, job-clobbering NAFTA. Moreover, the rarely-heard-about Atlantic Council (AC) is also playing a substantial role in the current attempt toward near-complete globalization. The AC, a registered 501(c) (3) non-profit organization formed in 1961, operates somewhat more openly than the rather secretive TC, which was born in 1973. Still, high-level government officials have come directly from the AC’s ranks. When then-AC Chairman James L. Jones stepped down in early 2009 to become President Obama’s national security adviser, he was replaced as AC chairman by Charles Timothy “Chuck” Hagel, who had been a Nebraska senator. Hagel went on to become Secretary of Defense. The way that many of today’s policy groups and “think tanks” work is to marinate members in the gospel of globalization and then send them on to “public service.” Other big names include: Susan E. Rice, who left the AC to serve as Obama’s ambassador to the United Nations; Eric K. Shinseki left to become Secretary of Veteran’s Affairs; and Anne-Marie Slaughter went on became Director of Policy Planning at the State Department. Ms. Slaughter, a TC member, has attended the even more exclusive Bilderberg Meetings. And TC member R. Nicholas Burns was to attend the AC meeting in Washington. In short, these groups network so tightly that their roles sometimes blur. Interestingly, “Europe Whole and Free” were the exact words spoken by North Atlantic Treaty Organization (NATO) Secretary General Anders Fogh Rasmussen when he recently addressed the Brookings Institution here in Washington. As AFP examines the writings and policies of Rasmussen and other global expansionists, they’re all singing approximately the same tune right when their two prized free-trade deals—the TTP and TTIP—could either sink or swim. Another matter of interest is that AC’s chairman is Jon M. Huntsman Jr., the former governor of Utah and 2012 presidential candidate on the Republican ticket. Furthermore, patriotic elements in Switzerland, which does not belong to the EU, are working to resist pressure for the long-independent Alpine nation to join the 28-member union. This is critical, because Europe can never be “whole and free” without that happening—yet Switzerland has prospered without EU membership. But the central question is whether the global structures which these groups seek are compatible with U.S. sovereignty and Constitutional limits. Ultimately, it’s profoundly difficult to see how national autonomy and full-bore globalization can live on the same planet. The Bilderberg group’s founders helped create the basis of the EU in the first place—and now that group and these other key groups form the vanguard of a movement that seeks an even greater degree of unelected global control.